My Father, over the past year, has had several brushes with death involving brain bleeds. In response to that, he recently sent out a letter to the family and I asked if I could share the very end of what he wrote there with those who read this blog and he said that would be perfectly fine. It seems that that are not as many people open to life these days. I bought mom some flowers this year and announced that I thought she was the "pro-life mom of the year". Mom thought perhaps that was a contradiction but I told her that I thought not all moms are equally pro-life though it might be hard for her to imagine that. So what's my point here? You are all in a family that is very blessed and honestly, in my wildest dreams as a 24 year -old getting married, I could not have possibly imagined but I would not have exchanged the experiences we've had together for anything. I am truly surrounded and engaged by love. Each of you bring out special elements and unique characteristics (mostly good) of each other. Without such an abundance of family we would never see some of these special sides of each other and we would not be loved in the unique ways that our large family allows us to be loved by so many unique individuals. I guess another way to say it is if we only had 2 children, I would only be loved in three ways and styles and personalities (my two children and my wife. Since I have 11 children I am able to be loved and engaged by 13 different personalities and that had made my life's experience (and yours) so much richer than it would have been without such a pro-life mom. Of course I am not working God or friends into the math of this simple illustration. And God's love is the most important. I am simply trying to get you to see what it is that God has given us in our family. I think it is a shadow of our heavenly family and a sign of the type of joy we will experience in heaven when we are truly surrounded by love. To quote an old saying "home is heaven for beginners". Let’s first of all turn to the perception of the annulment process. The Church, so it goes, has taken Jesus, a pretty cool laid back guy who talks mostly about loving everyone and bashing and breaking rules, and then along came the Church, which suddenly set up a gigantic bureaucracy and erected gigantic hurdles and unnecessary rules, laws, and regulations, all of which make Jesus seem a lot more difficult to approach. The annulment process is often viewed as the most obvious example of Church bureaucracy, and, so it goes, this could NEVER have been what Jesus intended, and so if I had a divorce and remarried, then God understands. First of all as a response, I think it is important to read a past post on this topic by clicking here. Secondly, let’s look at Jesus’ words on the topic in Matthew 19: “I say to you, whoever divorces his wife (unless the marriage is unlawful) and marries another commits adultery." Notice Christ’s words – divorce and remarriage = adultery. He doesn’t blink. His Apostles follow up with basically, “wow, that’s hard.” Jesus doesn’t blink or back down. What we need to ask ourselves is this – is the stereotype of the Church true, or is it perhaps actually the case, as G.K. Chesterton noted, that the Church actually SOFTENS the words of Jesus in certain key situations? Often times, in order to dismiss the Church, people use the “bureaucracy” argument to justify their decision to not go through the process, but I think people need to be steered in the direction of Matthew 19:9 and spend some time really praying over that passage and asking themselves if the stereotype of the Church as the dictatorial gatekeeper to "cuddly Jesus" is based in reality. The annulment process, contrary to perception, is actually ALL about healing. People often tell me “I’m over her or him since our divorce” but I just don’t think that is usually the case. There is a BIG difference between Saying "I'm over so and so" and actually BEING over so and so. The process seems intimidating as well because it is often lengthy. However, it takes a lot to gather all the necessary information. Some people especially bristle at the idea of having to get written statements from exes and their families and so forth – people say that they’d just rather not go through that and open up old wounds. Sometimes, when a wound is infected and never properly healed, it must be reopened in order to be authentically healed, and that is the case with the annulment process as well. The Church also teaches that those who have remarried without first getting an annulment are not in a state in which to receive the sacraments. That is also perceived as very harsh, but it is something that should hopefully be an impetus to couples to first get right with God. Let us pray for all of the families out there who are wrestling with the annulment process! Also, those who are going through it should know that it is EXTREMELY inspiring to priests to see couples who have remarried but are working on an annulment stepping aside from the Sacraments for a time while they get right with Christ and His Church through the annulment process. Catholics that have divorced and remarried prior to receiving an annulment can still work towards an annulment and, upon receiving one, can have their new marriage blessed by the Church and thus resume receiving the Sacraments. Finally, here is a great essay from a young adult on her sometimes rocky but ultimately worthwhile experience with the annulment process. Click here to read. Apparently, my classes on homosexuality have caused quite a stir on the gay blogosphere so to all who flooded youtube and this blog with comments please know that while I am on vacation, I will try to reply when I get back. Very important, concise, and well written report from Thomas Peters about groups spending tons o' cash to try to secretly subvert Church teachings and confuse faithful Catholics. Read the report by clicking here. I'm heading off to Rome tomorrow to visit some friends and get some r+r. I hope to still have a few blog posts throughout the week, and I promise to provide a full report of my trip upon my return. email me any prayer requests that you have, and I will try to keep them in mind in a special way. Buena Serra! This is the trailer for a movie coming out soon about St. Jose Maria Escriva. I'm definitely looking forward to it! Homily on the Transfiguration - "I Saw Dead People"
In this homily, I also forgot to mention my favorite comparison to what the Transfiguration was like for the Apostles (and what spiritual visions and experiences are like for us) - the minimarathon! My whole family is training and preparing to run the mini, and every mile or so on the minimarathon route there is a water station every mile or so. The water is something you take while you keep running. If a runner stopped at the water station and just kept drinking water the runner would only be distracted from doing what the whole race is actually about. Likewise, I think if we receive consolations from our Lord then they are something to keep us moving forward - not to stop there or to try and cause it to happen again. If we did that, we'd be missing the whole point. Here is the follow up which is also okay, but it seemed like a chance for Morley to get some digs in that he wouldn't have said to the Archbishop directly. Anyways, still worth listening and watching because some of the thornier issues are brought up. Battery ran out on the second half of my talk, but I thought the first half went pretty well. Sorry about the darkness - it was in St. John's Catholic Church. Theology has a bad ring to it because people think that it is something that is in opposition to "spirituality" because theology talks about answers whereas spirituality is interested in mystery. The key here is to realize that while theology provides some answers, even those answers should always be seen as a deeper invitation to mystery. The answer to the question "what does the Church teach about homosexuality?" doesn't have an answer that can be "tweeted" - there are a lot of concepts that need to be looked at and discussed. The fact that the answer can't be "tweeted" is why the Church has already lost the debate on this issue. Steve Martin: Atheists Ain't Got No Songs! Found this on the Deacon's Bench Blog and laughed out loud! The Star finally had a pro-life letter on its oped pages today, about 2 weeks into their otherwise hostile-to-life slate of pieces they have been publishing. 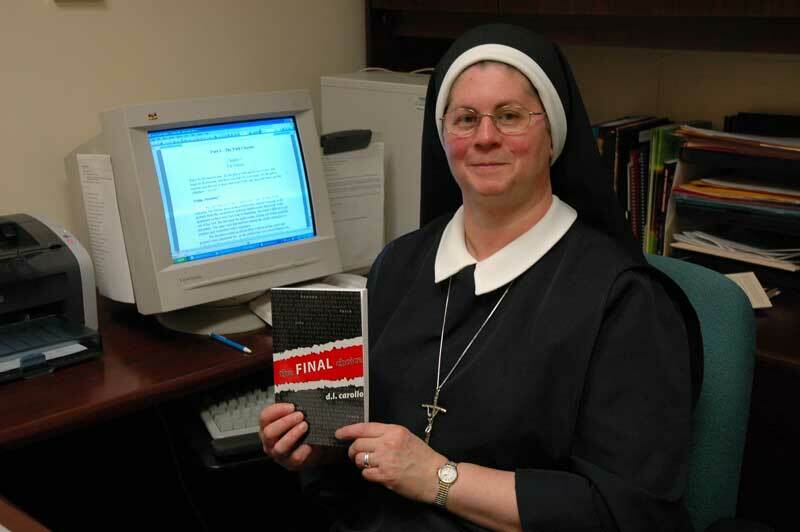 Sr. Diane Carollo, an avid and tireless defender of the rights of the unborn who heads up the Archdiocesan Pro-Life office wrote a great letter which can be read by clicking here. Planned Parenthood better watch out because as any priest will tell you - "Don't mess with Sr. Diane!" On a down note, two days ago saw the publishing of a letter from several CEOs from the Indy area asking our state not to pass a constitutional amendment defining marriage as between one man and one woman. Lilly's CEO, John Lechleiter, is rumored to be Catholic but one has to wonder how he squared that letter with his Catholic Faith. The letter makes the case that we would lose out on jobs if we passed the amendment, but given Lilly's recent layoff of thousands of employees, one would think losing out on new jobs would be the least of Lilly's worries. The letter also seems to imply that potential employees would be thinking to themselves, "Well, I'd love that job in an economy where unemployment is 10%, but that state is bassackwards because they have made what is already a law a part of their constitution." Come on now, that is quite the stretch. Marriage is already currently defined as a law between one man and one woman in Indiana, the bill would only start the process of making it a constitutional law in Indiana so that activist judges could not at some later date overturn it. Lechleiter needs to make the point instead that professionals out there are saying to themselves in a climate of 10% unemployment "I will take that job here in Indiana because, although it is a law currently that marriage is defined as between one man, at least it isn't written in the Constitution. The moment it becomes a Constitutional law, I'm walking and taking my talents to a state that doesn't have it in their constitution." Does he really think a significant number of people think that way? We could go down the anti-Catholic road here, but I also think it is, ironically, a sign of encouragement that we are singled out, and that is what I think Pope Benedict was getting at with his quote above. Catholic priests don't abuse children at any higher rate than men throughout society, but yet we are singled out for it. To me, that is a sign that people look to the Church to be more. This can suggest anti-Catholicism but it can also show that people are looking for more from the Church than they do other places. I would also argue that the rage at the Church goes beyond the public believing that we are hypocritical because there are many other religions in the U.S. that talk about right and wrong and sin, but we certainly don't hear about the child abuse rates of rabbis or protestant ministers even though those numbers are out there. Again, I think we should see this all as a sign that people really hold the Church in high regard and want Her to be better than all other worldly institutions, and we should be thankful that others are more disappointed with the failures of priests than they are with the failures of the average man walking down the street, the average protestant minister, or the average rabbi. The Vatican has set up a Youtube page to view quick highlight videos of each year of Pope John Paul II's Pontificate. The videos are neat to watch, especially for someone like me who came into the Faith relatively late in his papacy. It is really neat to see him so young and vibrant. As our minds turn towards hoops again this Spring I thought I'd share a great Catholic hoops story. I've had the good fortune of getting to be a part of some great athletic teams that have had some memorable accomplishments. I've played and coached football state championships, got to coach some city track championships, etc. I say this not to brag but only to say that I think my favorite memory involving athletics was the St. Meinrad basketball team that won the seminary shoot-out in 2006. I know, I know, I hear you snickering...seminary basketball? 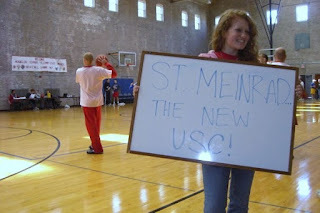 When I first heard of the tournament when I showed up at St. Meinrad, I chuckled myself. I pictured rec-spec wearing theologians with their shorts pulled halfway up their chests trying their hardest to dribble with only one hand all while constantly smiling and uttering Scripture quotes to cheer on the OTHER team. With those images ingrained in my mind I still to this day remember walking into Mundelein Seminary's gymnasium a few weeks later for my first Mundelein Shootout. The first thing I noticed was that the gym was PACKED! They had brought in extra seating at both ends of the court, and the crowd was big and spirited. One seminary that was playing when I walked in had brought all 50 of their guys and a mascot! The visions that I had of going "Michael Jordan" on a bunch of seminary nerds was also shattered because within minutes of walking in I saw a guy dunk the ball! I was also very impressed by the quickness and athleticism of a lot of the guys on the court. That first year of the tourney, St. Meinrad got POUNDED! The only team we beat was a seminary of about 15 Franciscan brothers, but most of the other schools whipped us. The next year we played better, but we were still demolished by a couple of better teams. My third year in the seminary saw some big changes. Ryan Harpole entered St. Meinrad in the fall of 2006 from the diocese of Owensboro. He had grown up poor, and, as he said, all he did was shoot hoops as a kid. He said he probably shot about 4,000 shots a day and to see him in action you would believe it. He NEVER missed a shot - it was like watching Larry Bird. Steve Hohmann also joined our team, and he was a big tall center who loved to get rebounds. In addition to the new guys, seasoned veterans (all now serving as priests) Fr. Matt Lowry, Fr. Paul Sullivan, and Fr. John Parks, all priests from Phoenix, Fr. Brian O'Brien from Tulsa (nicknamed sure-shot by my cousin) and myself all got better playing against each other a couple of times a week. Despite the new additions, we were still heavy underdogs. St. Meinrad, at the time, had about 80 guys in the seminary, but some of the other seminaries had double that number of seminarians. 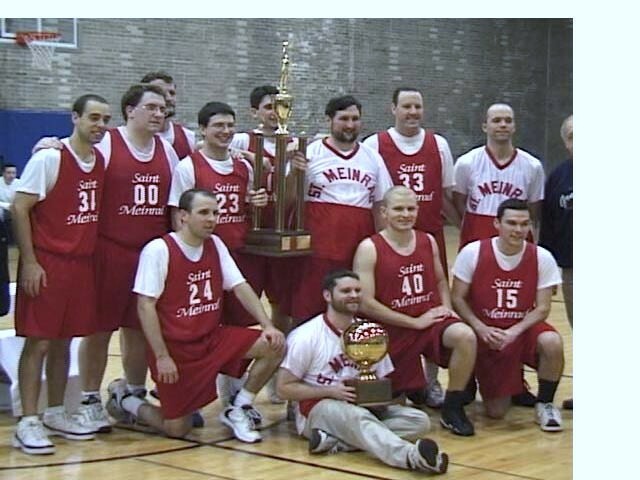 Mundelein, the New York Yankees of seminary basketball, had 200-250 seminarians. Mundelein wins the tournament almost every year because they have so many guys to choose from. Notre Dame's seminary was also a perennial power because they had a couple of former division 1 football players on their squad. Our championship hopes were not helped by the fact that we lost our first game on Saturday morning to Kenrick seminary. Because it was a double elimination tournament, we were not knocked completely out, but our road was going to be very difficult. We would have to win 4 more games THAT DAY just to make it to the championship game Sunday morning. 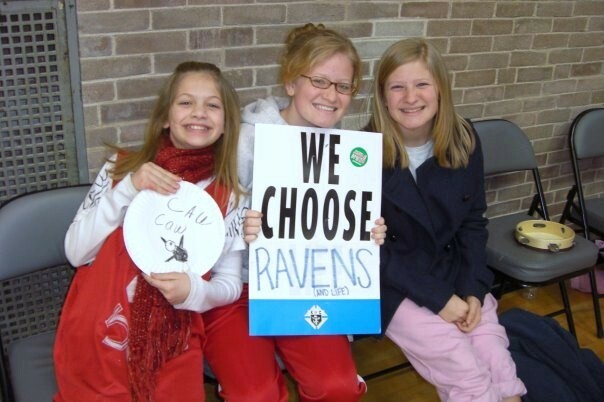 Needless to say the St. Meinrad Ravens pulled out 4 gritty wins only to have to face a well-rested Mundelein Lakers (their seminary is surrounded by a couple of lakes) squad who also enjoyed home-court advantage. Mundelein had us by about 4-5 inches at each position and all in the gym knew it was Mundelein's game to lose. Amazingly, we jumped out to a 12 point halftime lead, but Mundelein made their move and actually took the lead with a few minutes to go. It began to look like our title hopes were going to be dashed, but Fr. Brian O'Brien hit a gigantic three pointer to get us going again, and, as time expired, our defense kept them from scoring to give us the two point win! The tournament is hosted every year by the Knights of Columbus and continues to be an awesome opportunity for future priests from around the country to get together and build fraternity. If you are ever in Chicago the last week of January, stop in at Mundelein for a great Catholic event. "We Must Baptize the Internet!" "We must baptize the internet!" - Bishop Christopher J. Coyne, Auxiliary Bishop of the Archdiocese of Indianapolis. Reading the Star day after day has been so depressing these past few weeks. My morning routine has turned into "cereal and a Planned Parenthood propaganda article." I decided to write my own letter to the editor explaining the perspective from the other side, and I wasn't exactly surprised that it didn't show up. I then thought to myself, "I'll go and start debating the issues on Indystar's blog" and here is the irony - every comment on the Indystar.com on these Planned Parenthood Propaganda Stories is pro-life except for maybe one PP supporter who doesn't argue issues but restates PP's talking points. This is the problem with the liberal media - and it was illustrated recently by the comments offered by the NPR vice-prez - they think they need to move people to a different spot. JUST GIVE ME THE NEWS!!! As soon as editors and columnists start thinking that they are part of a privileged Ivy League elite circle of enlightenment, what follows quickly after is that the rest of us are bumbling dark-age idiots who need to either be euthanized or be brought up, through their "merciful" education efforts, to their level of intelligence. 500 show up at the capital for Planned Parenthood - front page. If you want to try and change peoples' minds then write a book, start a blog, make a movie, do something where you ADMIT to the fact, UP FRONT, that you are trying to change my mind. Don't pretend to be fair and balanced when your agenda is so disgustingly obvious. Of all the articles I've seen in the star in this 2 week "Support Planned Parenthood Campaign" one of them was more frightening than the others. The president of Planned Parenthood of Indiana had a column that was calculating, deceptive, manipulative, and downright scary. Read it here if you dare. One is tempted to go through line by line and dissect the stuff she says in her piece, but her piece is so cold and calculating that it seems like it would giver her piece more credibility than it deserves. I think the best thing to do here is simply say that Planned Parenthood's true colors are coming out, and, as many suspected, IT AIN'T PRETTY! In fact, it is haunting and eerie. I'll finish for now with my letter to the Star that didn't make the cut. May we pray for the day when all people are treated as persons again, and sanity is restored. "As the push to defund Planned Parenthood of our taxpayer money has intensified, Planned Parenthood has been publicly reminding the nation of its many talking points. I believe that most at Planned Parenthood want what society wants – a reduction in the number of abortions; the problem that many legislators (male and female) have with Planned Parenthood is their tactics. Planned Parenthood believes that the way to decrease unwanted pregnancies is by providing access to birth control for all. The question for Planned Parenthood is this – has this strategy worked? Since Roe v. Wade, according to Planned Parenthood’s own numbers, there have been 52 million abortions in our country. Would the number of abortions really have been that high if our country was not funding the distribution of contraception on virtually every street corner? What Planned Parenthood fails to mention is the failure rate for both the pill and the condom. Failure rates for the pill hover around 9% while condoms fail 15% of the time. Abby Johnson, a former Planned Parenthood clinic supervisor, notes in her New York Times bestselling expose Unplanned that although she was in charge of educating women about contraception as a Planned Parenthood clinic supervisor, she became pregnant three times while using Planned Parenthood’s methods and instructions perfectly. It seems logical that we are in fact increasing our abortion numbers by funding Planned Parenthood since they offer people a “fail-safe method” for preventing pregnancy which, in reality, fails alarmingly frequently. The other interesting thing about Planned Parenthood’s tactics is that each clinic has a quota for abortions each month. It is very disconcerting that an organization proclaiming to want to reduce unwanted pregnancies would also issue quotas to their clinics for a set number of abortions each month. Shouldn’t the quota be 0 for each clinic if abortion is the “last alternative”? Planned Parenthood talks about how abortions are only a small percentage of its work, but PP fails to mention that it is the only part of its work that makes money. It seems that Planned Parenthood should at least be asked to explain why it is that they have abortion quotas for their clinics. Should We Have Holy Water in Lent? How About Baptisms? As I have been hearing about some places removing holy water from their fonts again this year for Lent, I was taken back to the book I just finished - The Rite by Matt Bagglio. Is Holy Water just something that we should do without for a while? Satan and his minions certainly would seem to say yes because the book has numerous exorcisms, and almost all of them start out with the possessed person feeling normal, but when the priest sprinkles holy water on them, the demon can't hide, he lashes out, reveals his presence, and the exorcism begins in earnest. Uhm, thanks for the symbolism, but I'll continue to take my holy water at Church! "Holy Water is a power weapon of the spiritual life against the attacks of the devil. Holy water is a sacramental. It is not a toy, or something to be abstained from, like chocolate …. which is the stuff of a childish Lent. 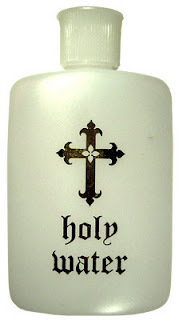 Holy Water is not to be removed from fonts until after the Mass on Holy Thursday." 2. The encouragement of the Church that the faithful avail themselves frequently of the [sic] of her sacraments and sacramentals is to be understood to apply also to the season of Lent. The “fast” and “abstinence” which the faithful embrace in this season does not extend to abstaining from the sacraments or sacramentals of the Church. The practice of the Church has been to empty the Holy Water fonts on the days of the Sacred Triduum in preparation of the blessing of the water at the Easter Vigil, and it corresponds to those days on which the Eucharist is not celebrated"
Parents are obliged to take care that infants are baptized in the first few weeks. As soon as possible after the birth or even before it, they are to go to the pastor to request the sacrament for their child and to be prepared properly for it. Today the Church celebrates Ash Wednesday, the beginning of her Lenten journey towards Easter. The Christian life is itself a constant journey of conversion and renewal in the company of the Lord, as we follow him along the path that leads through the Cross to the joy of the Resurrection. The primary way by which we follow Christ is by the liturgy, in which his person and his saving power become present and effective in our lives. In the Lenten liturgy, as we accompany the catechumens preparing for Baptism, we open our hearts anew to the grace of our rebirth in Christ. This spiritual journey is traditionally marked by the practice of fasting, almsgiving and prayer. The Fathers of the Church teach that these three pious exercises are closely related: indeed, Saint Augustine calls fasting and almsgiving the “wings of prayer”, since they prepare our hearts to take flight and seek the things of heaven, where Christ has prepared a place for us. As this Lent begins, let us accept Christ’s invitation to follow him more closely, renew our commitment to conversion and prayer, and look forward to celebrating the Resurrection in joy and newness of life. Today the Church honors the memories of Perpetua and Felicity - 2 saints we pray for when we use Eucharistic Prayer I. Perpetua and Felicity were two women who were victims of the Roman persecution of the early church and were tortured and eventually killed in the arena for sport. A quote from their reading from today's Office of Readings: "The day of the martyrs’ victory dawned. They marched from their cells into the amphitheater, as if into heaven, with cheerful looks and graceful bearing. If they trembled it was for joy and not for fear. Perpetua was the first to be thrown down, and she fell prostrate. She got up and, seeing that Felicity was prostrate, went over and reached out her hand to her and lifted her up. Both stood up together... The people, however, had demanded that the martyrs be led to the middle of the amphitheatre. They wanted to see the sword thrust into the bodies of the victims, so that their eyes might share in the slaughter...Perpetua, that she might experience the pain more deeply, rejoiced over her broken body and guided the shaking hand of the inexperienced gladiator to her throat. Such a woman – one before whom the unclean spirit trembled – could not perhaps have been killed, had she herself not willed it." This doesn't make the approaching of Lent sound so bad! I ran the 10K two years ago for the same reason, and both years, the same incredible thing happened to me at almost the exact same spot in the race. Now it should be known that I'm not a very good runner and I don't really know what I'm doing. Both years, I have started out way faster than I should have, and so both years, as mile marker 4 approached, I was doubting whether I would be able to finish the last 2.2 miles. Thoughts of quitting or at least slowing down seemed to race through my head. And this year it happened again at mile marker 4. Some anonymous runner came up from behind me and then just started running alongside of me. We didn't look at each other and we didn't say a word to each other (we were too tired!). We just ran together, step for step, for 2.2 miles. It was so much easier to run once I had someone along side of me. What had seemed like an uphill race where I was isolated and alone for the first 4 miles suddenly became a partnership with some anonymous and unlooked for companion who was now jogging alongside me. After the races both years I simply gave the guy a five and said, "Thanks for the pacing!" Both years the anonymous runner said "Thanks for your pacing too." It was eerie how it had happened the same way for me both years. Why does this have to do with Felicity and Perpetua? As I was running with my anonymous companion both years I recalled the idea that saints often come in pairs. Felicity and Perpetua, Francis and Clare, Benedict and Scholastica, Peter and Paul, (and perhaps John Paul II and Benedict XVI someday) - these are just some of the most famous examples of how saints seem to often pop up in pairs. Why is this the case? It seems clear that it is much easier to run the race of life and to persevere through adversity when someone is running alongside you, pacing you, you pacing them, getting into a rhythm and knowing that whatever experiences occur you will be experiencing them with someone at your side. A shout out to my running companions from both years, and may we seek out those who will run alongside us in the race towards sainthood and the Heavenly Kingdom. From Bishop Coyne's address yesterday comes an ode to my favorite place on earth - St. John's Catholic Church. The video of Bishop Coyne's address can be seen below. It was an AMAZING reflection. Bishop Chris Coyne -- Ordination Remarks from Rocco Palmo on Vimeo.